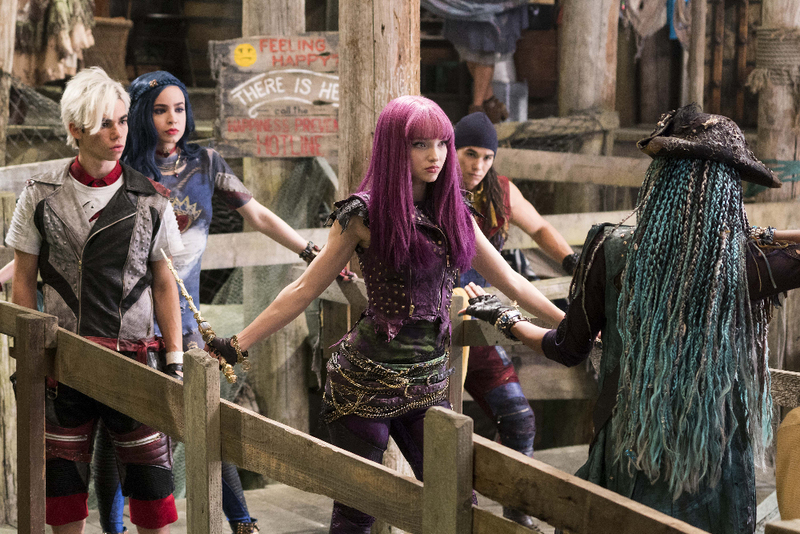 There will be another Descendants book! 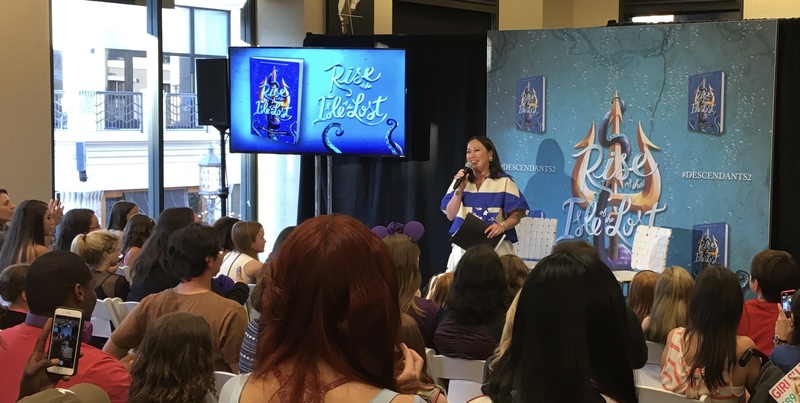 Thanks to Disney Publishing Worldwide, I had the chance to interview Melissa de la Cruz about her new book Rise of the Isle of the Lost. 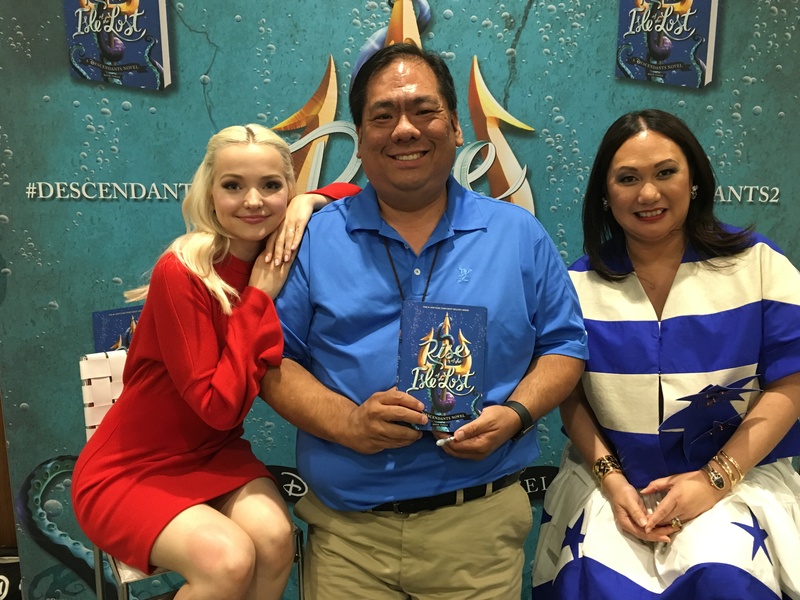 Along with Dove Cameron who stars as Mal in the upcoming movie Descendants 2, both were on hand for a live reading of Melissa’s book. She was gracious enough to let me interview her about the book and about the future of the series before they went out to meet their fans. It was great having both her and Dove together to share their own unique perspectives on the story and how it related to Descendants 2. Obviously the two of them have a great relationship with one another and Melissa, the cast, and the creative team involved with the entire franchise seem like a family. One question I had to ask was about the future of the book series. So far Melissa has written three novels set in this universe. Would there be more? After making sure it was okay to divulge the information she told us assuredly, “Yes!” But there were other questions I had the opportunity to ask her and she was so gracious to answer them. Probably because his parents didn’t want it at all. They didn’t even think about it until he thought of it. They were thinking of the villains as these horrible monsters and creatures and he was thinking of the children and how innocent they were. I don’t think it occurred to anybody until Ben came of age and could make proclamations to do anything about the kids on the Isle of the Lost. It’s always influenced by it! I get to visit the set, see the characters in costume, I go through the production stuff because we definitely want the books to translate that world into words. And it’s a prequel so you get to enter into that world through the books first. What a treat to have a picture taken with Melissa and Dove! I didn’t make the map! I love Ben’s part in the book. We got to see him in a different light, but his story was different than Mal and the other kids. Was that the purpose? Yeah, we kind of wanted to show Ben becoming king and dealing with diplomatic issues. Yen Sid is a character (from Walt Disney’s Fantasia) who features prominently in each of your Descendants novels. So the question is, where is Mickey? You know, I think there are no talking animals in my books. We do a little homage to him, but he doesn’t appear in the books. Is Sophie (Yen Sid’s apprentice) the child of a good or evil parent? She came from Sherwood Forest. She was an intern and was brought over with Yen Sid who is not evil. So there are people on the Isle of the Lost who came from Auradon to try and help and I love that! Are there any Disney characters you were not allowed to include in Rise of the Isle of the Lost or the other Descendants novels? Yeah, there are a few that Disney is very protective of. I can say Tinkerbell. She’s a very big character. So I could make up some other fairies. Dove: Well, Maleficent is an evil fairy so Mal is a fairy. How did you write so much about sailing and parkour? Did you write from experience or research? A little bit of both. I’ve written a lot of books about sailing for some reason. I wrote a series set in the Hamptons so I had a couple of characters who knew sailing. And we lived in the Hamptons so we knew a bunch of people with boats. My husband actually grew up with boats so that’s where that comes from and he kind of fixes all that stuff. As for parkour, we are not parkour people. I love the interplay between Uma and Mal and it was interesting because they didn’t have a lot of direct interaction in Rise of the Isle of the Lost but obviously these two characters have a past. Yeah, we wanted to keep them separate because we wanted to see them together in the movie. That was deliberate. I have to ask you one off-Disney question. We had to get Alex and Eliza (Melissa’s new novel about Alexander Hamilton) when it came out. Not just because we love your writing but my daughter is really into the musical Hamilton. Was that an influence for you? Yeah! So we went to see Hamilton our whole family with my 10-year old and after seeing it she was so obsessed with Eliza. She wanted to know what was true in the story, how did they meet, and so I was answering her questions and it occurred to me this would be a perfect young adult book! Because they met when they were teenagers and you know he wasn’t “Alexander Hamilton” yet. Dove: How old were they when they met? I think he was 19 or 21. We don’t know how old he was. He was an orphan. Dove: And she was how old? She was 17. I know! They were young. It’s so swoony. It’s funny that you ask that because I was thinking today about how we took my mom to Shanghai because my mom is half Chinese and wanted to see where her grandparents and this other part of the family is from. And I was like, ‘Oh my God. They went from Shanghai to Manila,’ and now we’ve moved to San Francisco and now live in LA. My kid is half Filipino, Chinese, Irish, Croatian, German… she has like 10 or 11 nationalities. My husband’s family were German immigrants, Irish immigrants, half the family has been here for 200 years, half just came from Russia, so it’s kind of crazy. And where else do people like that fit in but America? And that’s the great thing about America. It’s just amazing. To find out how Dove answered that question, check out our exclusive interview with her! Melissa is a well-loved author with many interests and the ability to write for all different ages. Her new book Rise of the Isle of the Lost is a joy to read and will make you excited for Descendants 2. And she is always gracious with her time and talents! If you’re a fan, you won’t want to miss her newest novel. Rise of the Isle of the Lost can be found at Amazon.com and booksellers nationwide.